Target Market/Client: In-House inventory use. Designed to manage the components of machines and also machines themselves produced by my company. Figure 1. 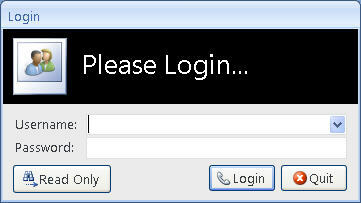 Shown above is the Login Screen which is set to show first when opening the database. The user is allowed to select his/her name from the Combo Box and enter in the correct password in a masked field. Or if the user is only interested in retrieving information and not altering it, he/she can press the “Read Only” button which will grant him Viewing access to the database. After clicking the Login button successfully, this event will check the username against the password and setup the privileges that have been given to the user and alter the environment accordingly. Figure 2. 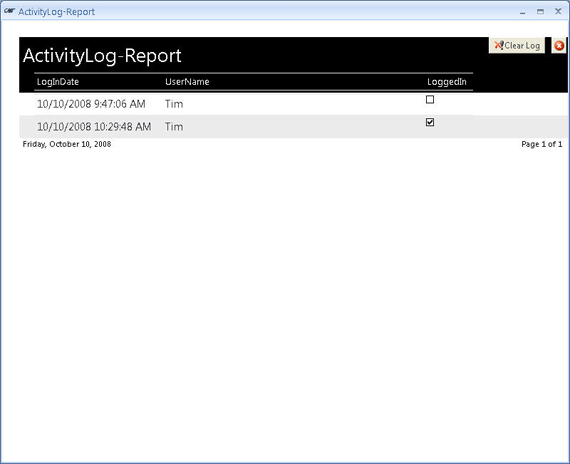 Shown above is the “Main Screen” form which acts like a Switch Board giving you access to all of the other forms and reports available in the Database. There are 3 tabs currently at the top of the Middle section. 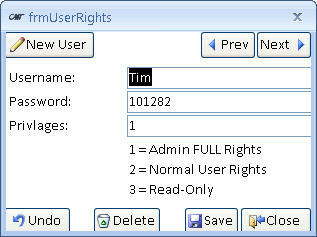 The Last Tab Called “Admin” is only shown when the user Logged in has been granted administration rights to the Database. 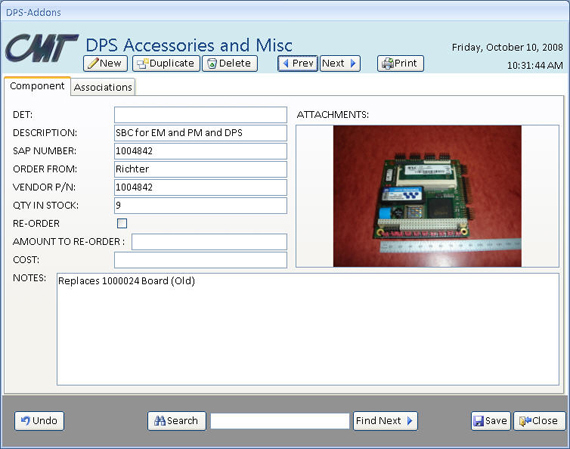 Located at the bottom left of this screen is a search Control which will search the entire database for the criteria entered in the unbound text box. Pressing “Search” will open up a form containing a subform whose data has been filtered using the criteria in the Text Box through a query. Figure 3. 2nd Tab called Reports. Very simple screen with Command Buttons allowing you to open up forms containing results from a query. Figure 4. 3rd Tab called “Admin” containing controls which will allow you to view an activity log as well as a form for setting up users and modifying their rights and privileges. Figure 5. 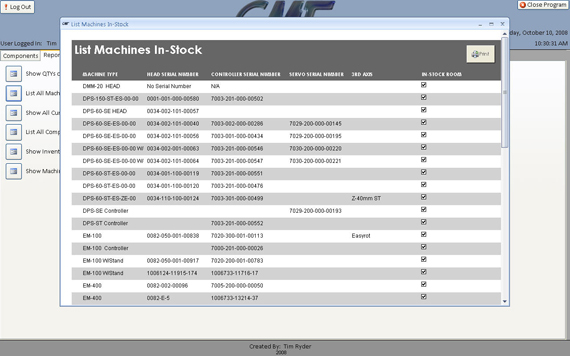 Here is one of the Forms under the “Reports” Tab which displays a list of all of the machine currently located in the stock room. Shown here is a report whose data has been filtered through a query. The requirement is that the record MUST have a “True” set in the “In-Stock” field as seen here. Figure 6. This is the form found under the Admin Tab where you can Create/Edit/Delete users as well as change their privileges. Figure 7. This the form which open when an Administrator presses the “Activity Log” button. There are 2 identical records showing. 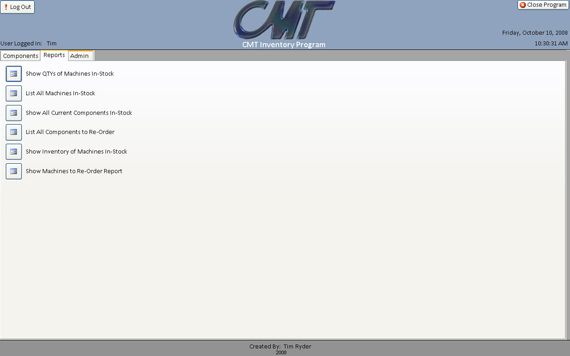 The first line shows that the user logged in and when the user logs out the program will create a second line whose checkbox will Un-Checked indicating a successful Log-Out. Figure 8. Here is an example of one of the forms used to display a Record in the Database. Each of the buttons on the Main Screen will open one of these forms and the records are filtered through a query to only display the components which are associated to the type of machine whose button you clicked.